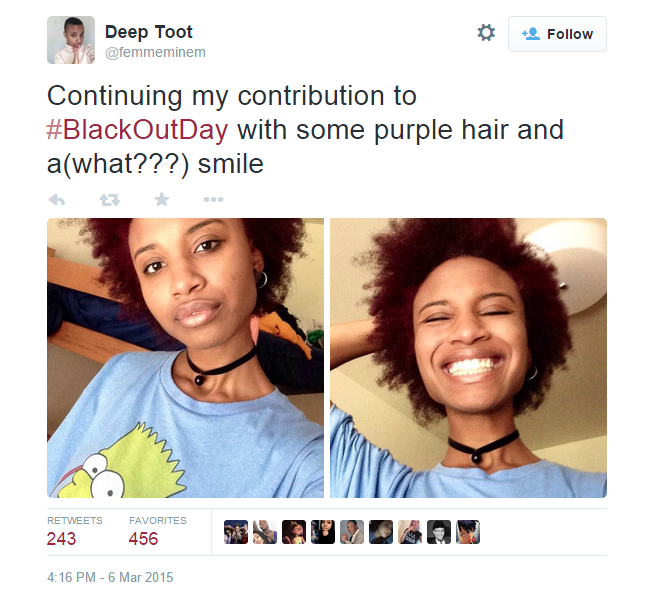 On March 6th, 2015 Tumblr and other social media hosted the first BlackOutDay to counter the notion that beauty is a whites-only affair. According to a statement published in the official page of the movement, on BlackOutDay black users “like and reblog selfies of each other and fill our dashboards with encouragement”. Since then, the day has been made seasonal, with the second event taking place on June the 21st and more anti-racist initiatives added to the agenda. As a new instantiation of the “black is beautiful” motto, BlackOutDay is concerned with appearances, style, and self-presentation. Particularly, its message of racial pride is delivered via the selfie, a medium of self-representation that notoriously focuses on the face and facial expressivity. The circulation, reblogging, sharing, and commenting of tens of thousands of pictures that has been going on since March on social media is proof of the urgency with which black subjects engage the global visual culture as a space to produce a nuanced narrative of blackness. With Black Twitter as a channel of networking and contagious opinion-making across racial lines (Sharma 2013), the black selfie expresses the desire to make racial embodiment a part and indeed a framework to experience and address our digital selves. 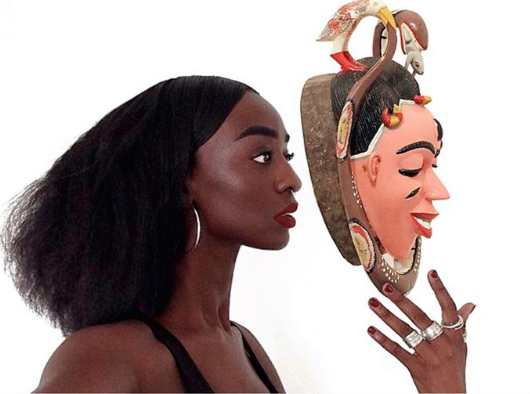 The use of the selfie in visual activism is rising especially among racial minorities, who practice DIY photography and photo-editing to “fashion alternative public visibilities” (Pham 2015: 232). Typically set in public and/or anonymous locations, like bathrooms and bedrooms, these shots reference the everyday, the accidental, and even the unglamorous, contributing to normalize perceptions of a supposed threatening, abject, or abnormal diversity. 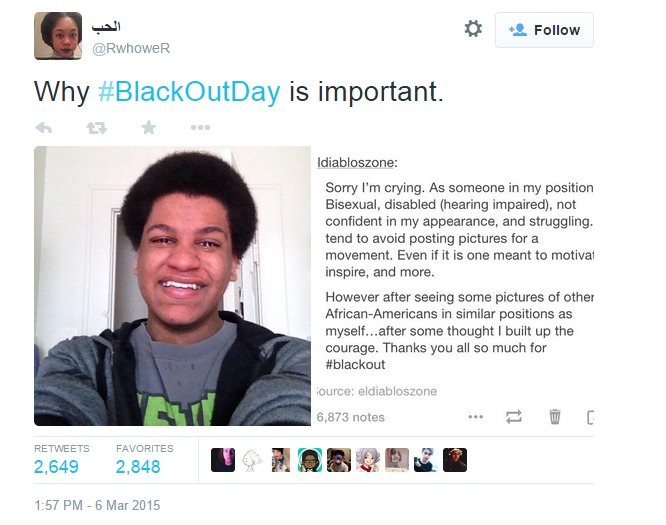 In its self-referentiality the selfiescape inspired by BlackOutDay also wishes to foreground the diversity inherent in blackness, making space to represent minorities within the macro-minority of blackness like LGBTQ users, users with disabilities, etc. In effect, BlackOutDay is a vernacular and collective effort to counteract the bias of racialized profiling that is inherent to mainstream visual and popular culture where blackness is often linked to abnormality, of one sort or another – be it the disenfranchisement of black Americans, or the state of perpetual ‘need’ and ‘exception’ of Africans in their home countries and abroad. 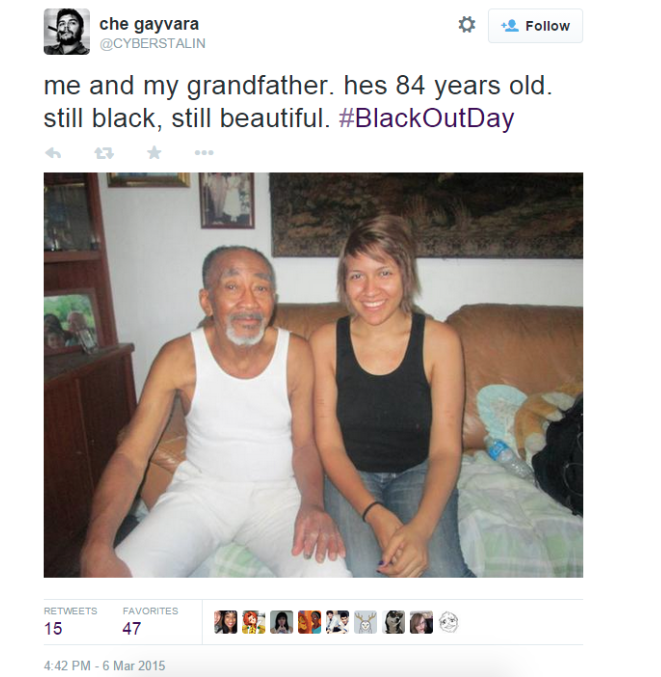 On some occasions, selfies have been prominent weapons of the fight for social justice. In the trial for the murder of Trayvon Martin, the defense used pictures that Martin had posted on social media as evidence of his ‘suspicious’ lifestyle, whereas for his family and the millions worldwide who took the side of the innocent victim one selfie in particular became the symbol of his lost innocence. According to Nicole Fleetwood (2015), Martin’s selfie has become a powerful catalyst because it operates as a racial icon that “conveys the weight of history and the power of the present moment, in which […] his presence marks the historical moment” (unpaginated, Kindle edition). Like other icons, the selfie distills conflicting tensions and turns them into a narrative with the power to generate attachment and prompt action. 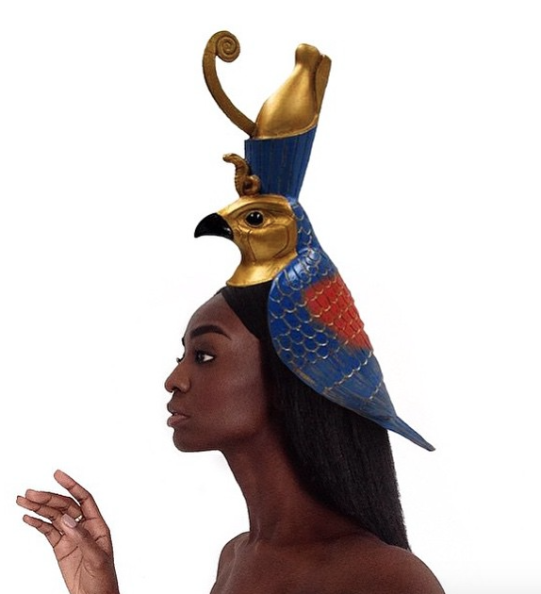 More importantly, it shows the power of blackness to arrest and hold attention within a image-saturated culture. “[T]he justice for Martin protests speak to the changing perception and reception of the icon and what it means to have ‘staying power’ in a cultural climate where the consumption of images occurs more often involuntarily and with such rapidity that it makes it challenging to hone in on a singular image” (Fleetwood 2015, id.). Yet, in Trayvon Martin’s story, the selfie is a tool of self-documentation that was only posthumously mobilized to political ends. In this sense, the tension between public and private, boy and citizen, that infuses Martin’s selfies acquires a different value and currency with death. It is up to those who are affected by his story to comment and keep alive the fight for inclusion and justice. Among these is Loza Maléombho whose selfie portraits were inspired by the assassination of Michael Brown in Ferguson. 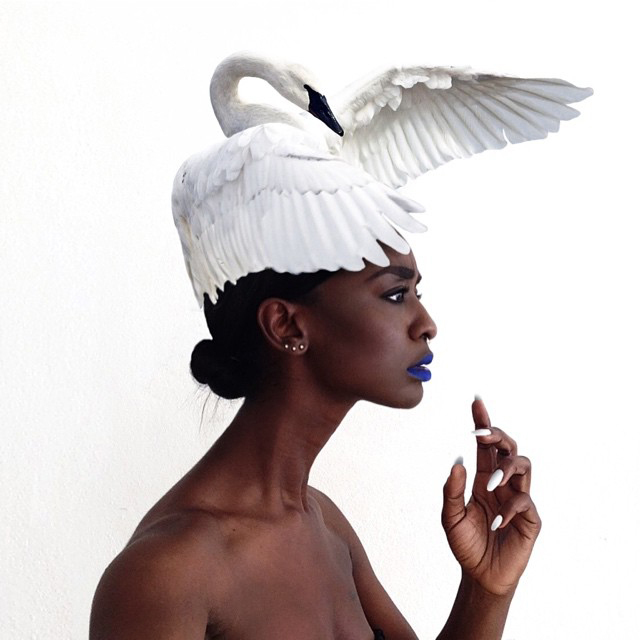 Maléombho is a black reasporan designer: born in Brazil, she studied fashion in New York and relocated to Cote d’Ivoire where she currently runs a shop and online e-commerce selling her creations. Recently, Maléombho has gained some online fame for her series of self-portraits entitled “#alienedits“. 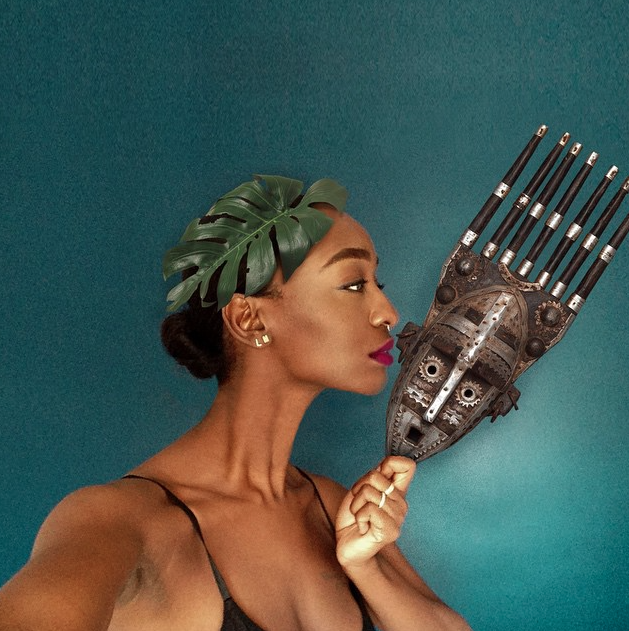 The selfies, which she routinely posts on her Instagram account, show her in profile, sporting African headwear, masks, and decorations of which she gives descriptions, filling her followers with information on African history. 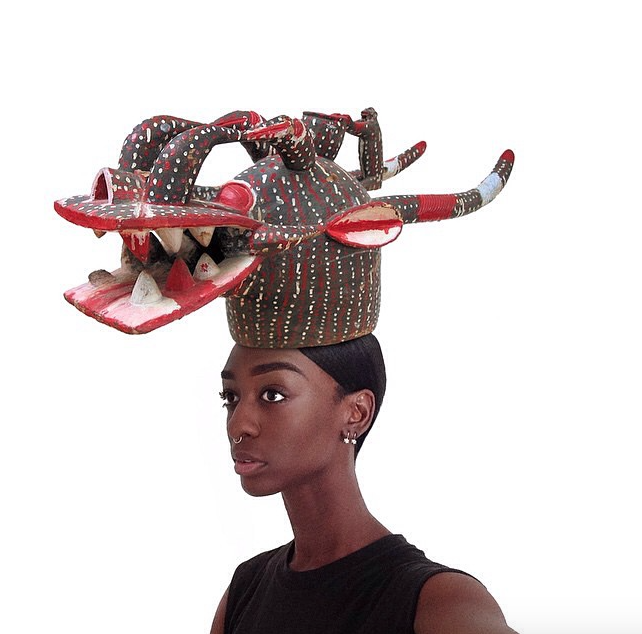 The designer describes the project to Le Monde Africa as a personal expression of African pride that she began to develop when she lived in the States. Africanness, in this sense, is filtered through the lens of post-diasporic blackness and imbued with the concern for visibility and recognition most strongly voiced by black Americans. 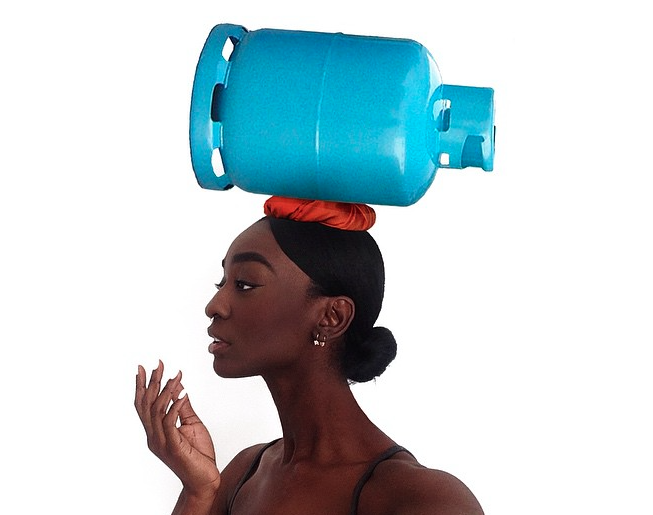 Most interestingly, she expands on the importance of self-composure, stressing the selfie’s semiotic power as a tool to channel black pride and fierceness. In the above description, the black selfie becomes the weapon par excellence of a racial politics of self-representation and reclamation across national barriers. It provides not simply a content to counteract the lack of positive and diversified visual proofs of blackness, but becomes a framework to perceive as black and African, importing African popular and often unacknowledged cultures into the frame using the visual possibilities of vernacular, DIY photography to push a message of self-determination. Pham, Min-Ha T. (2015), “‘I Click and Post and Breathe, Waiting for Others to See What I See’: On #FeministSelfies, Outfit Photos, and Networked Vanity”, Fashion Theory, 19.2: 221-242. Sharma, S. (2013), “Black Twitter? Racial Hashtags, Networks and Contagion”, New Formations: a journal of culture/theory/politics, 78.1, 46-64.